In this entry, I’m going to discuss the different types of dental decay and the reasons they occur. I’m hoping the information provided will prevent it from happening to you or anyone you know. I hope the accompanying picture is not too graphic or makes anyone turn away from reading this entry. I just felt it necessary to use such an extreme image, because in certain conditions, the decay process can get quite out of hand. I’m hoping that the graphic nature of the photo and the information provided will help to prevent you or anyone that you know, from experiencing it! A very common type of decay that is that found in young children is called Baby Bottle Caries. It only affects the primary or deciduous (baby) teeth. The decay pattern is very obvious to parents, as the most common teeth that are affected are the front ones. But it can also occur on the back teeth. The reason for the decay is because the baby’s or infant’s bottle is filled with milk, apple juice, i.e., liquids that contain sugar and these liquids are kept in contact with the teeth for long periods of time. The sugar in the liquids are broken down by bacteria in the mouth and acids are produced which eat away at the outer layer of enamel and then the softer inner layer of dentin (see blog #2). Important: parents, make sure that your kids don’t fall asleep with a bottle filled with liquids that contains sugar. It may help to get your child to sleep, but in the end, they will end up with a mouthful of heavy duty cavities. Water is a good substitute! Rampant Decay is	widespread decay and it includes baby bottle caries, but we like to classify vast decay on baby teeth separately. 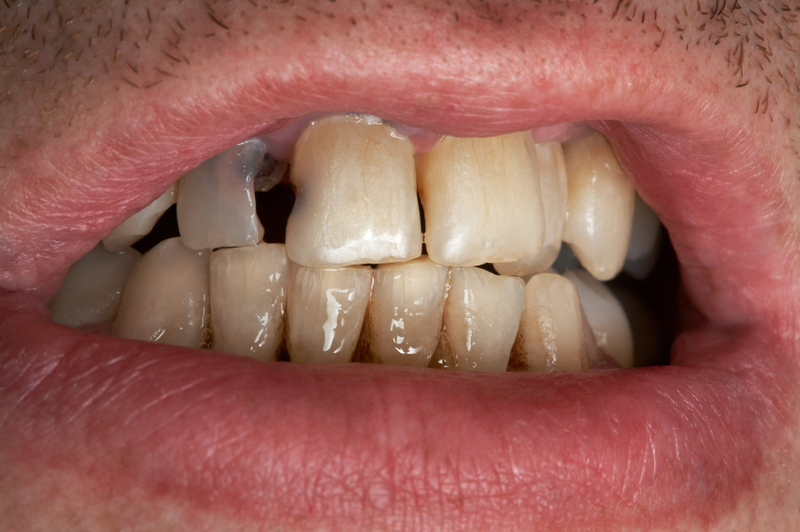 Like the word suggests, rampant decay is large visible decay on many teeth. There are various causes, which we will look at separately. 1)	Xerostomia: this means ‘dry mouth’ which is caused by a lack of saliva. This condition may be due to: medication, mouth breathing, medical conditions (Sjorgens Syndrome, diabetes), individuals on drugs (methamphetamine- resulting in ‘meth-mouth), radiation treatment and chemotherapy and a problem with the salivary glands. Dry mouth can cause bad breath (halitosis) and rampant decay. The above factors result in a decrease in salivary flow and if there is no buffering capacity from the saliva, rampant decay results. The treatment of xerostomia is basically to get the saliva back, whether in its true form or artificially. Chewing gum (sugar free) can stimulate salivary flow. Drinking sugar-free liquids is helpful as are preparations of artificial saliva called Carboxymethyl cellulose…it’s true; artificial saliva. 2)	Poor Oral Hygiene combined with a lot of sugar in the diet: If there is food left in the mouth and it is not removed via proper oral hygiene, the following will occur. Bacteria in the mouth break down the carbohydrates in the food (particularly, if the diet is high in sugar). This results in a process called ‘fermentation’ where acids are produced which cause the cavity process to begin. There is the balance that involves the following factors that will determine whether or not a cavity will start to form. These are: →the buffering capacity of saliva→frequency of exposure to fermentable carbohydrates and degree of acid demineralization→good oral hygiene practices→exposure to fluoride and mouth rinses. I will discuss this balance and the decay process in the next entry! Are you experiencing tooth pain? Does it hurt when you chew? Are your teeth sensitive to hot or cold? If you answered ‘yes’ to any of these, you may have a cavity or dental decay. To learn about preventing tooth decay and/or to find out if you have a cavity, give our dental office a call at (905) 791-3867 today. Practicing dentistry for more than 23 years, Dr. Robert Axelrad has owned and managed his own dental practice since 1997. Affectionately known by his patients as ‘Brampton’s Gentle Gentist‘, he moved his practice to its current, state-of-the-art dental office in Brampton, Ontario in 2002 to accommodate his growing list of happy patients.